Nothing in the manga says for sure whether he has lost the commandments or not. Some people just think it's probable because his original ability made him change to a new form. Seems like the wings are new. It's simply because they had no idea about his OG magic awakened in purgatory. A break? I thought this manga was ending, whats the deal with a break right now? Or is it not ending soon? 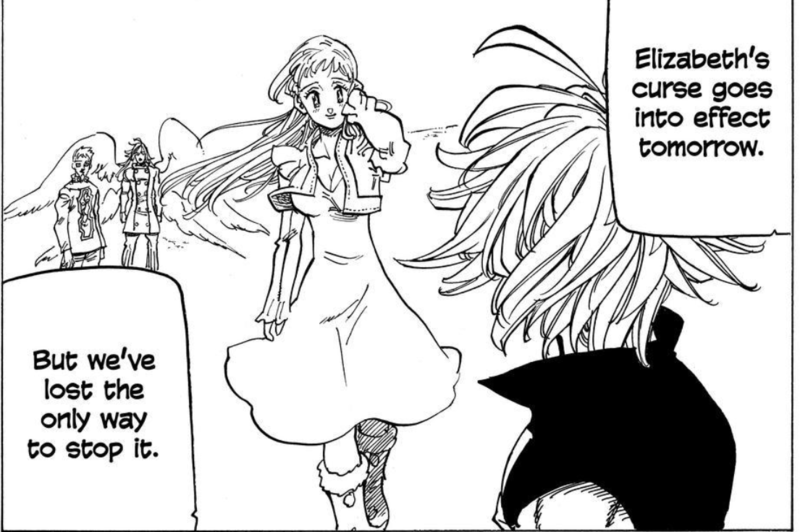 I say again and again that meliodas could have broken Elizabeth's curse 3000 years ago or he could have just defeated dk and sd 3000 years ago saving himself and his love Elizabeth from all this 3000 years of bs pain and suffering if he could just have used his OG power. Anyways all i want to say is that it was not nakaba it was actually meliodas who created NNT. I mean... as things are looking right now that is very much possible lol. He has 10 Commandments in him + his OG magic apparently. And the power scaling is completely gone by now. There's a panel OtakuFreak mentioned and I then posted after finding what he was referencing, they said in chapter 306 that he no longer has the only way to stop the curse, meaning he no longer has the commandments. Wait then why did he have the DK form even after the DK was "kicked out" from his body? It's not DK form, it's King Meliodas form, which can be obtained by getting possessed by DK, the adult fodder form, or by activating his own OG magic bs that resulted in his chibi curse destroyer form. Actually it's different from the DK-possession form where he was an adult. Now he's just a chibi like normal but with weird wings. Meliodas lost the commandments (making him not God-tier anymore) and apparently still needs to leave the mortal realm? lol nakaba's forcing the plot to move forward so badly. Huh. No Meliodas doesnt have the commandments because if he still does, DK will just go back again to possess Meliodas. Ok guys I think most of you got confused of what happened to DK. Mael said its over DK has been eliminated wiped out and vanquished which mean he was wiped out from Meliodas's body to take over it completely and vanquished means he was defeated badly. BUT it doesnt mean DK is dead. DK was just defeated and taken out from Meliodas's body. Which leaves to the possessor going back to where he was. Its like any other possession strong demon was defeated to control the body that is why the possesser goes back to hell. Same thing that happened to DK he went back to purgatory or maybe in hell. I believe that will happen cause it's meliodas after all.